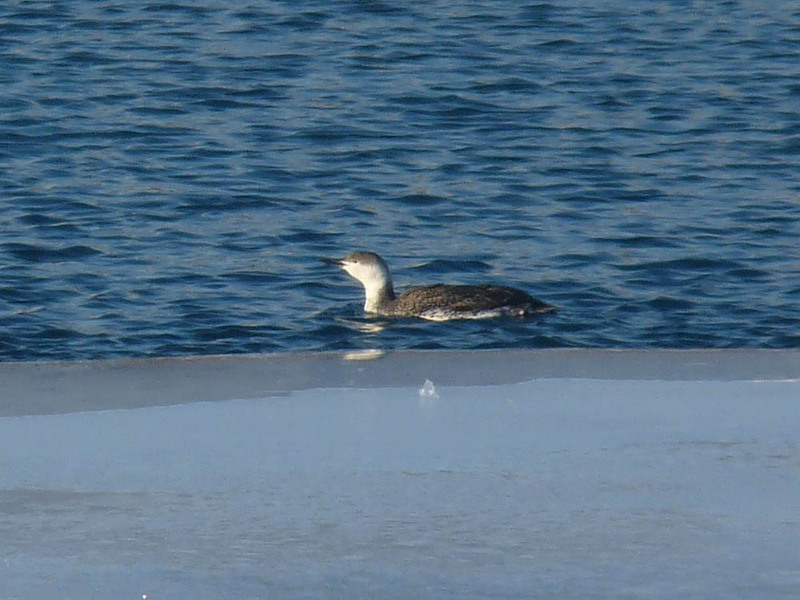 This entry was posted in Spring Bird Reports and tagged Common Loon, Great Black-backed Gull, Gulls, Long-tailed Duck, Loons, Red-throated Loon, Waterfowl, White-winged Scoter on March 29, 2014 by rhughes. A Red-necked Grebe with a mostly gray neck was working the harbor mouth at Montrose this morning, March 26. 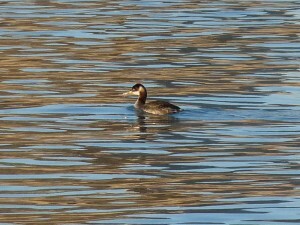 This is the third or forth Red-necked Grebe reported from Montrose this spring. This has been the best spring for Red-necked Grebes in Illinois that I can remember. Other birds seen at Montrose this a.m. include Greater and Lesser Scaup and Redheads in and around the harbor, several White-winged Scoters off the end of the fishhook pier, and Horned Grebes. 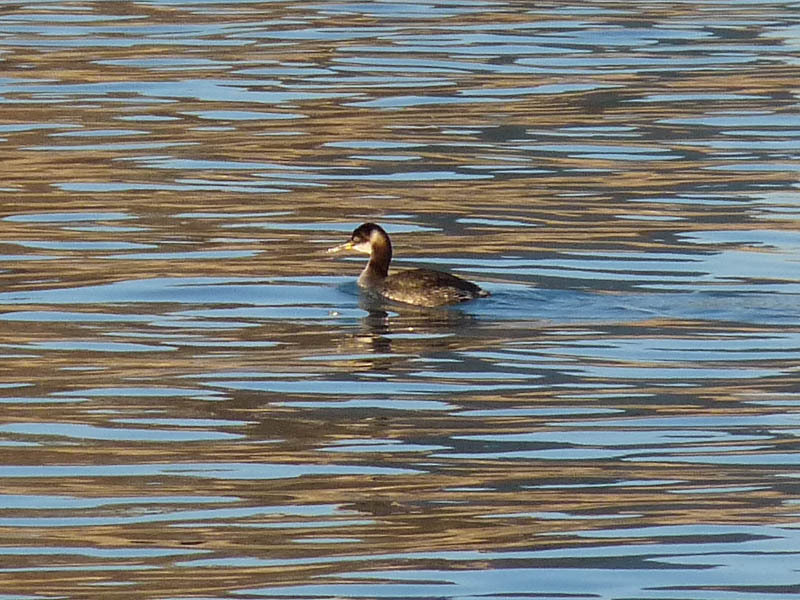 This entry was posted in Spring Bird Reports and tagged Grebes, Red-necked Grebe, Waterfowl, White-winged Scoter on March 26, 2014 by rhughes. A lone Snowy Owl was still at Montrose this morning, March 21. This bird, probably an immature female based on the heavy and extensive barring, was resting on the ice inside the fishhook pier. Other birds seen at Montrose this a.m. include several White-winged Scoters on the lake and inside the harbor, 4 northbound Northern Pintails, Greater and Lesser Scaup and Redheads inside the harbor, and 2 or 3 Horned Grebes inside the harbor. I did not see the Red-necked Grebe. 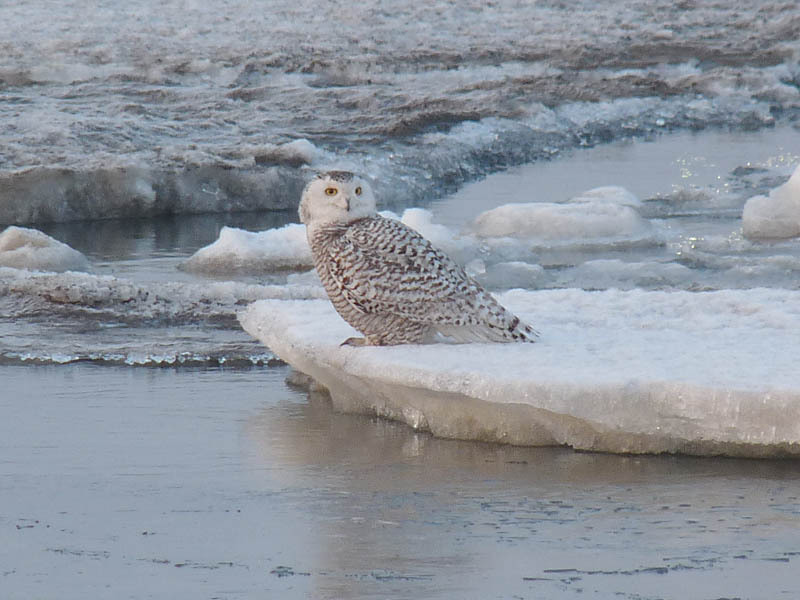 This entry was posted in Spring Bird Reports and tagged Owls, Snowy Owl, White-winged Scoter on March 22, 2014 by rhughes. 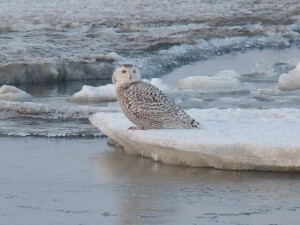 I had 3 Snowy Owls this morning, March 20, all on the shelf ice at the east end of the beach. I guess they had to come back eventually. All 3 birds were heavily marked and probably immature. Also, they were all very close to each other on the beach, probably within a hundred yard span together. This entry was posted in Spring Bird Reports and tagged Owls, Snowy Owl on March 22, 2014 by rhughes. This is beginning to sound like a broken record. Lake Michigan was ice covered from horizon to horizon but there were a few areas of open water and these open areas had birds. 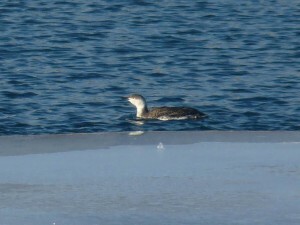 Best was probably the Red-throated Loon at the harbor mouth. Unfortunately the bird flushed when a fisherman walked onto the north pier. This must have been one desperate fisherman as there was barely enough water to fish in. There were also a dozen or so White-winged Scoters and a drake Long-tailed Duck here. 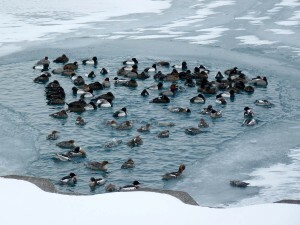 A larger group of ducks (100-150 birds) were in the lake a couple hundred yards north of the end of the fishhook pier. I didn’t have my scope but most appeared to be scaup, White-winged Scoters, and mergansers. Another small pool of water south of here held more White-winged Scoters and 2 Long-tailed Ducks. A few ducks are hanging on in the ever decreasing water hole near the bend of the point. It’s really a sad sight. There were probably more birds standing on the ice around the hole than actually in the water, and there were multiple dead ducks scattered around. Finally, I heard a Snow Bunting flying over the beach. This entry was posted in Spring Bird Reports and tagged Long-tailed Duck, Longspurs, Loons, Red-throated Loon, Snow Bunting, Waterfowl, White-winged Scoter on March 7, 2014 by rhughes. I went over to Montrose this morning, March 4, to see what was around. There were a couple very small areas of open water along the shore, one at the harbor mouth and the other near the tower at the bend of the point. Both areas had birds, mainly White-winged Scoters, Greater Scaup, Redheads, Common Goldeneye, and Red-breasted Mergansers. The open area near the tower was all of about 10 feet in diameter and crammed with birds. The situation looked desperate and reminded me of when whales get trapped in small areas of open water surrounded by ice in the Arctic. Lake Michigan was frozen from horizon to horizon, though there was a decent sized lead just east of the fishing pier. I couldn’t figure out why the ducks that seemed to be trapped didn’t just get up and fly a few hundred yards to the larger area of open water. Maybe they were afraid of losing their places or leaving the safety of what little open water they thought existed. When I was walking back from the fishing pier I did see a group of scoters flying from the small area of open water near the tower to the lead, so some of them figured it out. I also saw several dead ducks on the ice which I guess shouldn’t be surprising considering the conditions. 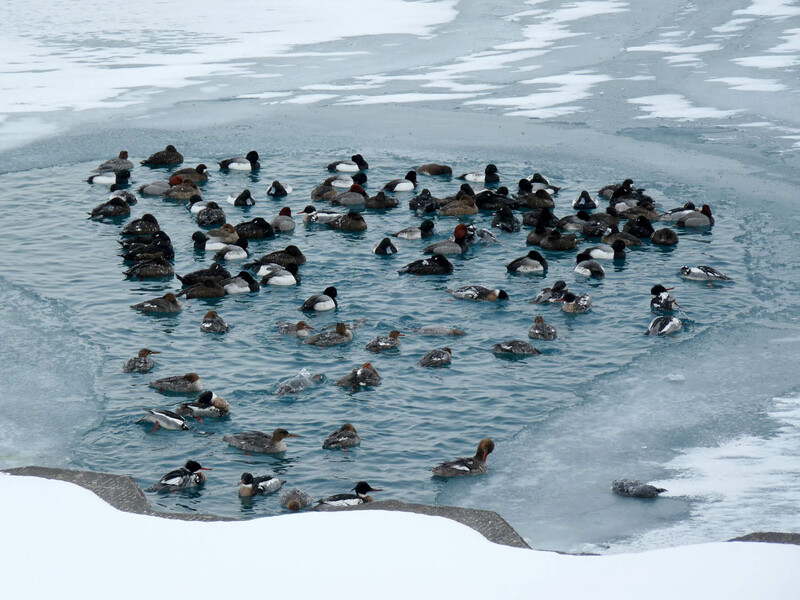 This entry was posted in Spring Bird Reports and tagged Ice, Lake Michigan, Waterfowl on March 4, 2014 by rhughes.